Iranian Air Force warplanes and Unmanned Aerial Vehicles join Navy Wargames. 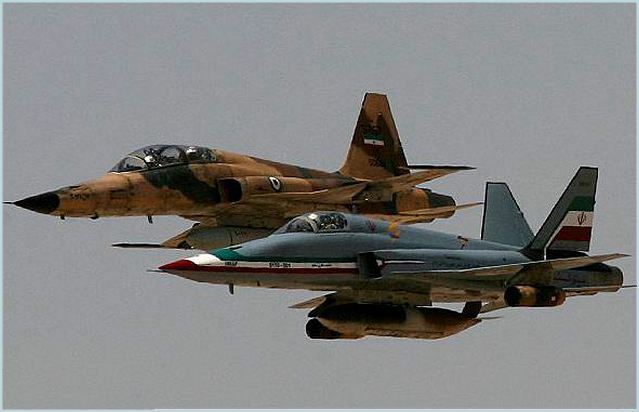 TEHRAN (FNA) - The Islamic Republic of Iran Air Force (IRIAF) fighter jets have joined the country's Navy wargames underway in the international waters of the Sea of Oman and the Indian Ocean. Speaking to reporters about the fifth day of the naval drills in the country's Southern waters, Lieutenant Commander of the Iranian Navy Admiral Seyed Mahmoud Moussavi said that different warplanes and Unmanned Aerial Vehicles (UAVs) of the Iranian Air Force have started conducting air drills over a vast area of the wargames general zone. Moussavi, who is also the spokesman of the wargames, added that the Navy's sea-based and land-based drones have conducted patrol and reconnaissance missions over hypothetical enemy vessels today. He added that the air drills have played an important role in promoting the practical and operational knowledge and skills of the navy's young forces and personnel. Iran's naval forces started massive wargames, dubbed as Velayat 90, in an area stretching from the East of the Strait of Hormoz in the Persian Gulf to the Gulf of Aden on Saturday. The Iranian navy vessels embarked on fortifying the country's coastal waters to prevent infiltration of hypothetical enemy vessels and submarines on the first day. The Iranian forces have also conducted tests in electronic warfare field using modern home-made electronic jamming equipment to disrupt enemy radar and contact systems. Yesterday, the Iranian Navy started the tactical phase of the military exercises.